I arrived at the park early on Sunday morning, even though I was forty-five minutes later than usual. In a flurry of last minute emails, we had switched our usual time of departure from eight to nine. Splash must not have received the latest information, for his car was here and he was not. Other than that, the parking lot was empty. I unloaded the bright, white Acadia that was nominally owned by my wife, Betsy, and looked at it wistfully. My usual Acadia had sprung a leak which seemed to be getting worse, and I decided at the last minute to make the switch. A leaky boat was a condition that couldn’t be ignored in December, but it didn’t seem right to leave my trusted companion home. 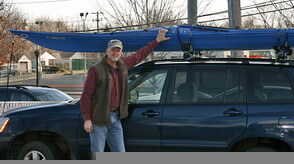 Even though they were the same model, my kayak had a rear bulkhead, which had proved to be beneficial on several occasions, while Betsy’s did not. Besides, that old green boat and I had been through so much together, that I felt like a traitor going out in another boat. I returned to my car, and continued to stew. Several minutes later, I observed Bullwinkle’s truck in my rear view mirror. He slowed to a stop and backed in next to me, his kayak extending beyond his truck bed. At least I thought it was his kayak until I took a longer look at it. It was not his old kayak at all, but instead it was a bright new fiberglass boat. That got my attention. I hustled over to the back of Don’s truck and scrutinized the boat. Wow, it was long and sleek and shiny. With a white bottom and royal blue top, it was a vision of two toned brilliance that seemed to extend forever. It appeared to be twenty-five to thirty feet long. By this time, Bullwinkle was standing next to me, grinning like a new father. All I had to ask was “what’s this” and he unloosed a torrent of excited words just waiting for someone to receive them. I laughed, not knowing if he was kidding or serious. At about this time, he discovered that he had forgotten his new paddle, and he drove off to get it, leaving me alone with his new kayak. I couldn’t resist, and I climbed in. It was a bit snug, but I have been in tighter boats. The expanse of glistening deck that stretched out before me made my heartbeat quicken. It was beautiful. I got out and did a more thorough inspection. The boat was made by Current Design, which also made Roy’s boat. Constructed of fiberglass, it was approximately seventeen feet long and less than two feet wide. This particular model was called a Caribou which struck me as ironic. A moose in a caribou was not something you were likely to read about in a genetics class. By now, Bullwinkle had returned and Don Juan, Paul and Greg had arrived on the scene. Each was treated to Bullwinkle’s animated description of the events of Thursday, except Greg. He had received a personal visit from the proud papa the night before, and heard the three hour, unabridged version. Only after everyone had been properly briefed on our new acquisition to the fleet, did we set about to launch our kayaks. Bullwinkle and Don Juan set off quickly to intercept Splash and bring him up to date on the recent development, while Greg headed toward the East side. That left Paul and I to meander south, Paul in his sleek, seventeen foot silver bullet, and me in my borrowed white baby’s bathtub. Sometimes size does matter. … The problem with an impulse buy is the inevitability of buyer’s remorse. It may not occur immediately, but it will show up sooner or later. The speed of its arrival is usually directly proportional to the amount of money spent. With the kayaks, this unwelcome visitor arrived as I was driving home with Betsy and Ben, both of whom were quietly pondering whether or not the kayaks were destined to join my growing collection of unused exercise equipment. Perhaps sensing my unease, each offered support, opined that kayaking would probably be a lot of fun, and then let silence envelope the car. The churning in my stomach, rapidly increasing heart rate, and beads of sweat dotting my forehead provided physical evidence of the idea that was forming in my skull: I had screwed up big time. I needed to do something fast or risk ridicule for years to come. I considered calling Visa and telling them that my card had been stolen, but the dealer might have issues with this tactic. Fortunately, I reverted to my logical, mathematical self in time to avert compounding my mistake. I remembered that trip, the anxiety I felt, and chuckled. It had all turned out very well. I had kayaked so often that the cost of all the equipment I have ever purchased was probably less than $5 an hour, proving that this particular impulse buy had been a good one. Maybe it was time for another. I still wasn’t sure if Bullwinkle was kidding or not, but if he was serious, I would go. I must have been a terrible companion for Paul on the way South. “No … don’t you want me to come along?” was his response. That wasn’t it at all, I assured him; I just didn’t understand why he would want to make that trip again. “Would you go if I didn’t?” he asked, and I admitted that I wouldn’t. “Well that’s why I want to go” he announced as if that settled the argument. Actually, it did settle the argument. How could I possibly refuse to go under these circumstances? Bullwinkle had taken it upon himself to give me the kick in the pants I needed, and I was moved by the fact that he felt so much concern for my kayaking welfare. Either that, or he was embarrassed to be seen in my company while I was paddling that speckled white rec boat. It didn’t matter the reason; we were going on a road trip! I drove home and broke the news to Betsy. I’m skipping work tomorrow to drive two hundred miles to buy a kayak, or words to that effect were what I blurted out. Betsy has always been very supportive of my kayaking … it relieves her of preparing dinner two days a week … so I was not surprised when she responded “great, you need a new one.” Nor was I shocked a half hour later when she announced that she would use the upcoming Christmas vacation to buy a new car. What could I say other than “great, you need a new one.” In the world of domestic relations, that is known as value for value. I hated to drive all that way without giving the rest of our group the opportunity to enjoy a boy’s day out. I dashed off a note advising that seats were available on a first come, first served basis, and offered to pick up things for those who couldn’t make it. Splash replied almost immediately; he wanted in and a seat was reserved for him. Greg sent a note asking me to pick up “a black, lacy teddy.” I responded that I couldn’t do that because we were going to the Peconic Paddler, not the Peculiar Peddler, and I didn’t think that they had what he wanted. One more message cleared up the confusion. It seems that this coming Saturday would be Shirley’s birthday, and Greg had given me the list he had meant to give Paul, who has been known to make side trips into Times Square when he is teaching on the island. What Greg wanted me to look for was a black deck bag. That I could handle. Actually, I could handle the other thing too, just not on this trip. If I dragged Splash into that kind of store, we would never get home. The next morning, I picked up Splash just before seven. He quickly claimed “shotgun,” but then had second thoughts. Did I think that Bullwinkle should sit in the front, since he was the only one who knew where we were going? I thought about that for a moment: Bullwinkle is a very energetic guy, and this morning he was likely to be caffinated. No, let’s leave him in the back. We reached Bullwinkle’s home ten minutes later, and sure enough, he was standing there with three coffee mugs. Fortunately, two were for Splash and me. He settled into the car, and we were off, our great adventure had begun. Now Bullwinkle had been to our destination before, and Splash had the foresight to look at a map, but I was completely oblivious as to the location of our objective and the route we would need to follow to get there. That was alright because I was only the driver, and I didn’t need to know Riverhead from Riverdance. Someone else would have to navigate. I had other things to think about. Such as, if I wrote a story about this trip, what would the theme be? We could be the three wise men journeying East; no, too religious. How about an elf, a dwarf and a hobbit traveling to land’s end to (M)order a kayak? We could be Legalumps, Gimpy, and Buildboat, the fellowship of the paddlers, off on a quest. By the time I stopped playing with these ideas and concentrated on the driving, we were in the Bronx. Bullwinkle was now the autopilot, and he kept telling me which bridges not to take, rather than emphasize the one I should. For my part, I just decided to follow the guy in front of me since he seemed to know where he was going. Between the three of us (Bullwinkle, me, and the guy in front of me - Splash was too entranced by the trees he saw in the Bronx to be any help), we managed to find our way onto Lawn Guyland. We shot over the Cross-Island Expressway and got on the infamous Long Island Expressway. I had never been on the L. I. E. before so I asked Bullwinkle how long we would be on it. “Just until the end” he laughed, but he told me we would make better time if I stayed in the “HOV” lane. Sounded good to me. Or it would have if he had told me what the heck a “HOV” lane was. It turned out to be the “High Occupancy Vehicle” lane that was a fourth lane of traffic located on the extreme left of the highway. The rules were that once you were in that lane, you could not leave it except at designated spots, usually dozens of miles apart. Since it was only one lane wide, and you couldn’t escape from it, you had better drive as fast as the guy in front of you, or else the guy behind you would be operating his car from the back seat of yours. And what was the magic barrier that kept you from leaving your lane? It was a white strip, approximately two feet wide, painted on the pavement. That was it. There we were, on Long Island, hurtling down the highway at warp speed, and the only thing that kept someone from pulling into the lane in front of us was the honor system. Leave it to Splash to find the silver lining: the police couldn’t pull us over for speeding because they wouldn’t be able to enter the “hov” lane. I considered this thought and pressed the gas pedal lower. By 10:30 we had found Riverhead. Bullwinkle’s sense of direction started to fail him at this point, and we were forced to resort to the most hated of all measures. We had to stop and ask directions. I pulled the car alongside a working girl loitering on the sidewalk, and her eyes lit up at the sight of three aging gents in my Highlander. When she found out that we only wished for directions, she pointed the way or flipped us the bird, I’m not sure which, and I drove off in the direction her fidgety finger indicated. Several stops and starts later, and Bullwinkle had once again picked up the scent. “There it is,” he cried. “Where?” Paul and I responded in unison. I still didn’t see it. All a saw was a tiny concrete block building and a small parking lot. That couldn’t be it, could it? Apparently it could. I pulled into the parking lot and only then did I notice a fenced in yard with scores of kayaks deposited inside. Now I felt better. Bullwinkle hustled us inside where he introduced us to Jim, the proprietor. For a while, Bullwinkle did all the talking while Jim cautiously gave us the once over. When Bullwinkle was finished, the conversation was over. Laconic Jim from Peconic Paddler was not about to waste time in small talk. Eventually, he asked what we were looking for, and I poured out my soul to him. Please, please, Jim, make me a real kayaker by selling me a real kayak. While I was talking, he was staring at me intently, obviously stirred by my sad plight. My plea concluded, I waited for Jim’s reaction. “I only have two that will fit you,” was his pronouncement, but at least I knew why he had been staring. Bullwinkle was disappointed that I didn’t get the same savings that he did, but the price was discounted substantially from the suggested retail price, and it was less than I was prepared to pay. Having concluded the primary transaction, we ventured into the store to see if there were other bargains to be had. I also had to pick up Greg’s little black number. 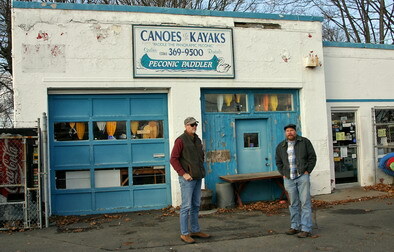 Now that Jim saw that we were serious shoppers, and maybe even serious kayakers, he opened up a little. 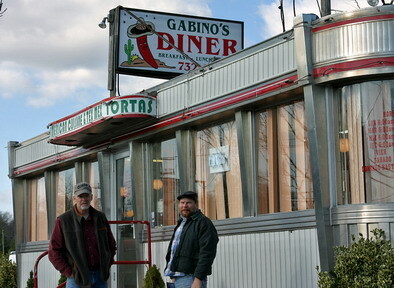 He had been in the business for forty years, and it was time to get out. That note struck a chord with me. While I chatted with him, Splash and Bullwinkle would constantly interrupt to ask the price of an item. It wasn’t that the items weren’t marked with prices, it was just that the marked prices weren’t correct. Often times, Jim didn’t know what the price was and he would throw out a number to see how it sounded. It was haggling at its best or worst, depending on your point of view. For Splash, it was torture. Not only could he not find a tow belt, but he had no idea what things cost, and it drove him crazy. I ended up adding a spray skirt and Greg’s deck bag to my order, and that completed our mission. Once everything was loaded in the car, it was time for the next order of business: lunch. When the waitress came back to ask about dessert, Bullwinkle and I couldn’t answer. We were too busy staring. Splash gave me an elbow to the ribs, and I muttered that all we needed was the check. Out in the parking lot, I paused to gaze at my new kayak, regally perched on top of my car. Man, it was long. I wasn’t used to having a boat that stuck out so far, and I wondered about tying a red flag to the end. At about this time, a box truck started accelerating out of the parking lot, which would not be significant except for the fact that the parking lot was so narrow that there was barely room for it to get by my car. The three of us stood transfixed, first looking at the truck, growing larger by the second, and then at the kayak extending into its path. None of us could move and the occupants in the truck were oblivious to our concern. In fact, they were laughing and joking and probably didn’t even notice us. I had visions of the truck performing a sternectomy on my new boat, and I was about to leap in front of the truck when it swerved and flew by my rudder with inches to spare. We all dissolved into nervous chuckles, and settled in for the ride home. That, at least, would prove to be uneventful. The next night would have a full moon, and I decided to take advantage of the fact that we would have a substantial crowd present to make my maiden voyage. I didn’t plan on capsizing, but I wasn’t sure it wouldn’t happen either, so I wanted to have friends available to fish me out of the river. I came home from work early, and loaded everything I could think I might need into the car. My hands felt like ice when I finished strapping the kayak to the roof rack. It was only twenty-four degrees, and the temperature was dropping fast. I really didn’t want to go in the water tonight. Once again, I was the first one to the park, which was good because I had to adjust the foot pegs and otherwise set up my new kayak. It turned out to be easier than I thought, and I nervously paced around the parking lot until the rest of the gang showed up. Splash, Don Juan and John arrived first, followed by Roy and Pat. After giving a brief explanation about my new boat, Don Juan and I carried it to the water’s edge. The moment of truth was at hand. What had worked then would work now, and this time I would have companions. Good companions. Roy, Don Juan, Splash and Pat each took turns flanking me and distracting me with light conversation. Before I knew it, the trip was over and I was no wetter than when I started. As I climbed out of the kayak, I could feel the tension drain from my body. It was like starting all over again. How often do you get to do that? Our small group of paddlers was augmented by Bonnie, Debbie, Theresa, Greg and Bill. The ladies came to join in the full moon celebration, and the men to see if I had swum. Greg also was anxious for that little black number I had picked up for him. The usual good natured mirth and merriment broke out, and we all tried to stay warm, assisted in part by the soup Greg had brought. Unfortunately, it was a losing battle. Soon we were all hopping from one foot to the other, and we had to give in to the elements. It was time to go home. The next day, I was still feeling upbeat about my new acquisition, although a heavy dose of reality had set in. I knew it would take a long time for me to get used to the side to side rocking, and I would have to train myself not to overreact to it. But the good news was that I hadn’t let this get to me last night, when my anxiety was not doubt heightened by the dark and the cold. I was like those old kid’s toys, the Weebils: I wobbled but I didn’t fall over. I checked my emails to see if anyone had any witty comments about the full moon proceedings, and no one had. I don’t think the rest of our group understands that the internet was invented for the sole purpose of allowing friends to entertain each other. Hadn’t they ever received that memo from Al Gore? There was one new message though, and that was from a local dealer who had learned about my latest acquisition. It seems the news traveled fast. Apparently, the dealer was not too impressed with the boat I bought, and had no reservations about sharing this news with me. In fact, the dealer had experienced difficulty selling a new model of the same kayak this year, and it became somewhat of a boomerang boat. It was eventually sold, but only to be returned within a week. Seems that this boat just wouldn’t track a straight line. Had the dealer known that I was interested in such a turkey, I could have had it for half of what I paid to Jim. Wow, that’s not the type of news that is likely to put a spring in your step. During my career as a lawyer, there have been numerous times when I have been forced to tell clients that they screwed up. I never looked forward to it, and tried to highlight the positive points. Now I was on the receiving end of such news, and I felt empathy for the message bearer. A good deal of angst must have been felt in deciding to relay this information to me after I made my purchase. As for me, I couldn’t ignore what I learned, and I would have to evaluate and act on this new information. The price issue was the easiest one to deal with. I’ve never been a shopper, and overpaying for something has become something of a routine for me. Jim and I had agreed on a price that was acceptable to each, and that is all that mattered. Besides, like all the other proud sponsors of the Malden Yacht Club, I understand that there will be considerable sums spent promoting our pursuit of the proverbial good time, and this would just one more example. I might have saved some bucks by buying locally, but I would have missed out on the road trip. Once again, it was value for value. The news about the potential technical deficiencies of the kayak was another matter. This information could only result in one reaction from me, and not a predictable one at that. In business and most personal matters, I pride myself in being able to review things in an objective manner, analyze the relative strengths and weaknesses of a position, and cut my losses where necessary. This is the Dr. Jekyl part of me. Unfortunately, Mr. Hyde governs that part of my personality that deals with my reaction to any type of negative news relating to an exercise program or athletic pursuit. Tell me that my approach to such an activity is wrong, and I become incredibly stubborn. It doesn’t matter if you are right, because I won’t believe it. I will have to discover it for myself, and it might take years before I concede. Mr. Hyde was on the loose now. My kayak had been disparaged, and that was all it took for me to galvanize my plan. It was us against the watery world. We would become like the Lone Ranger and Silver, Roy Rogers and Trigger, or Captain Kirk and the Enterprise. “Blu-yak” and I were now a team, conjoined at the hip, my hip. Together we would battle wind, wave, and weather cocking. We might tack down the river like a drunken sailor, but we would eventually reach our destination. We might even make it back. I had given up trying to look good doing things a long time ago, and I would paddle like a spastic crab if that is what it took to move us up and down the river. I may have bought a lemon, but it was MY lemon, and I would grow to trust it. I was stunned to be able to relate to what he said. Here he was, the architect of this episode, intuitively sensing my qualms, and bolstering my resolve. Perhaps we were kindred spirits after all. We would be like Don Quixote and Sancho Panza tilting at aquatic windmills. No, that reference was much too classical for guys like us. We needed something more plebian. OK, we would be the Malden Yacht Club Blues Brothers, paddling chaotically up and down the river in our new, blue kayaks, much to the consternation of paddling aficionados and law enforcement officials alike. Jake-Mac and Elwoodwinkle, or Jakewinkle and Macwood. It didn’t matter, because by any name we were going to be the Blues Yakkers. Now that put a spring in my step, and I started whistling “Hold On, I’m Comin’” as I turned off the computer. Sunday couldn’t come soon enough.